PM 481 Puente Vinagrillos , Durango, Mexico. 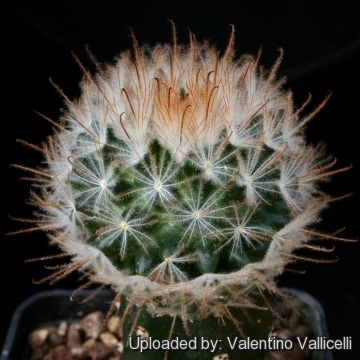 It is an exquisite spined miniature though difficult to keep growing in cultivation, it is immediately recognisable by its beautiful white, feathery spines and is surely one of the more popular of the genus. Origin and Habitat: Southwest Coahuila and Durango (between Bermejillo and Mapimi) Mexico (Area of occupancy less than 1 km2). Altitude: It grows at 1200-1500 metres of altitude, where it is rare. 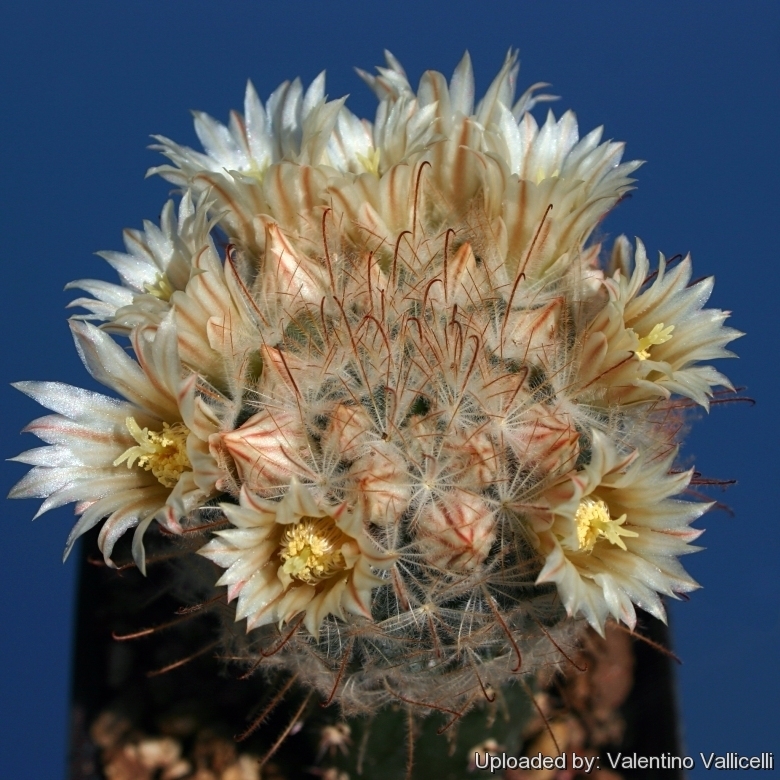 Habitat and Ecology: It is found in crevices in steep volcanic rock in desert. 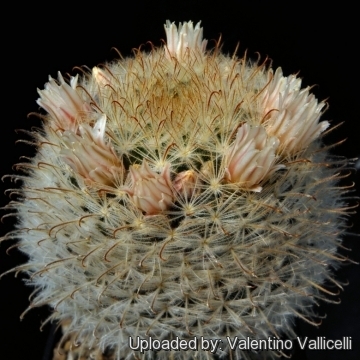 Mammillaria pennispinosa is listed as Critically Endangered due to its very restricted area of occupancy of less than 1 km2, its occurrence in a single location, and ongoing population decline due to illegal collection. The current population is estimated to be less than 1250 individuals. 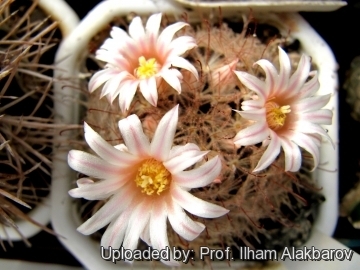 Description: Mammillaria pennispinosa is one of the most peculiar mammillaria species whit green body almost completely obscured by the creamy-white to pale pink and orange-pink plumose (feathery) radial spines and the brown hooked central. Two subspecies are recognized, the nominate form and subsp. nazasensis (Glass & R.C.Foster) D.R.Hunt. Habit: Plants, at first solitary, will form clusters up to 7 cm wide in the course of time. Stems: Globular, 3-4 cm high and in diameter. Without lacteal juice. Tubercles: Flabby, cylindrical, The axil is woolly at first, later naked. Central spines: 1-3, brownish red with yellow bases, covered with white pubescence, 10-12 mm long, one hooked. The additional central spines (if present), are similar to the radial. 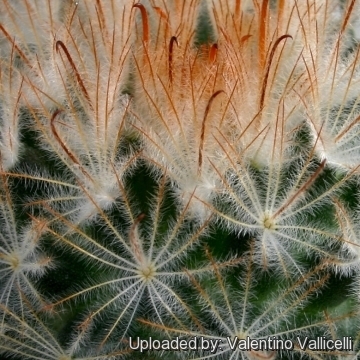 Radial spines: 16-20, featherlike, slender, straight, plumose, grayish-white to yellow to orange to reddish, 5-8 long. Flowers: White with pink-carmine central veins, up to 15 mm long and in diameter. Fruits: Red, 15-20 mm long. Flowering season: Winter to spring, the flowers remain open for five or six days, exceptionally more. 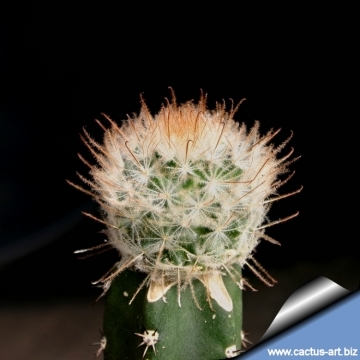 Cultivation and Propagation: Very prone to root rot, it needs a very permeable open potting soil, good drainage and a very careful application of water. 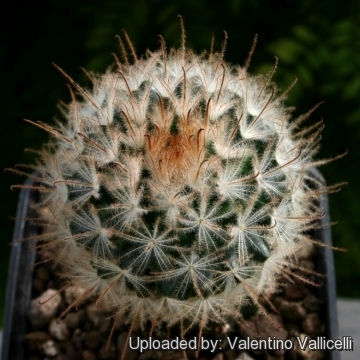 Additionally, water should not be applied from above, as the feathery spines will retain water and add to rotting problems, but in good conditions with excellent ventilation, in bright light, it usually grows without particular difficulty. If we succeed in growing a colony of more than 10 stems, then the results will repay all the growing efforts. Full light, short of direct sun, and high temperatures are helpful, and needed to achieve success in flowering. Propagation: Sow directly after last frost, or use cuttings (if available).